This new version of Harmony doesn't introduce visual changes but a few things that you may appreciate. First, the app should be much more faster to start. I optimized how the app is rendered and by caching the last rendered state of the app, was able to reduce startup time from ~1.5s to 0.5s on my machine. I'll probably write a blog post on that for other developers. Settings are also now faster to start. The other big thing, is the ability to create and remove playlists directly from Harmony. You'll also have a few informations like the total duration of a playlist and its author, in the contextmenu. Apart from that, 0.9 is mainly a bunch of bug fixes and small improvements in the app. 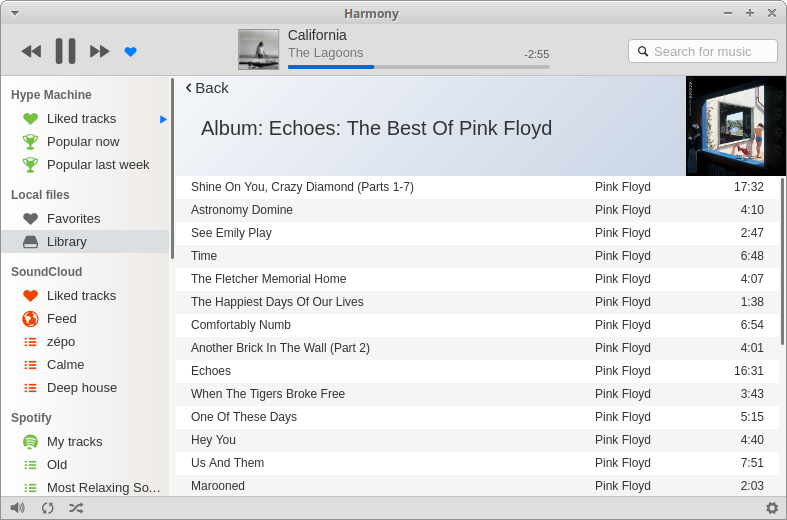 Harmony's newest version is out and is again an important milestone for Harmony. First off, let me say sorry for the bug asking to "install the YouTube plugin". It was a very deep bug, hard to debug. So the settings were entirely redesigned to allow for more complex plugin's configuration. They are also now much more clearer and intuitive. For developers, plugins are now full NPM module. It means they can now be completed with any existing NPM module making them more powerful than ever. I'll update the documentation in the next weeks. Finally, I worked on making the app more integrated to the system by using the system's context menu and having a much better menu for the menu-bar (on Mac) along with fixing appearances issues here and there. Another big change is the introduction of the coverview, to replace the old coverflow. Next I improved the app responsiveness: you can now fully use all its functions even resized in a small form (like switching playlists). 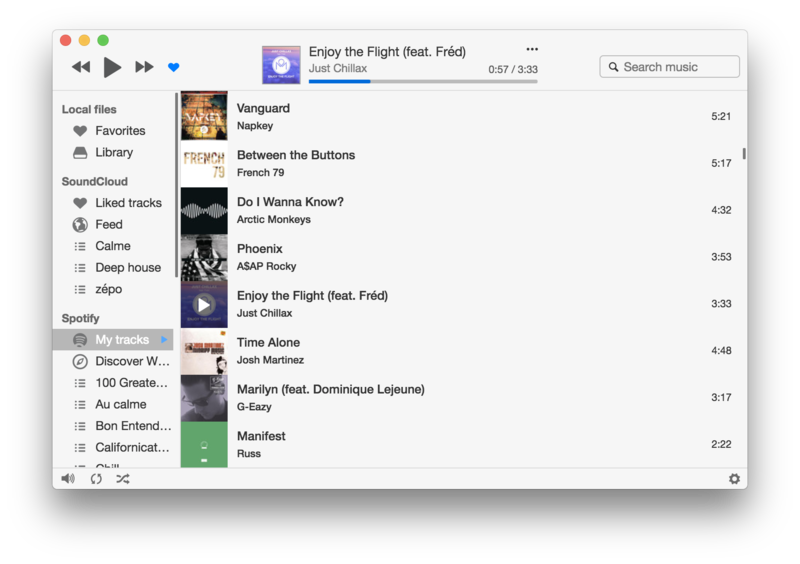 The search was also improved: by default it filters the current playlist but when you press enter it'll search in the cloud. That allows to have a filtering function and a global search without bloating the app. Developers can now finally create their own plugins, as it is possible for users to install third-parties in Harmony. I'll progressively start writing a documentation. Finally, say hello to the Reddit & YouTube plugins! On a sidenote, I replaced the subscription license with a one time lifetime license, as I feel like few people are willing to subscribe to this kind of software. Current subscribers will have their subscriptions cancelled after 3 years and be switched to this new plan. Quite important release for Harmony! v0.6 now introduces a theme engine :) Themes are super easy to write, as they're only CSS files. I already converted @mandruis Ark's theme, available on Github. v0.6 also introduces the ability to select and do operations on multiple tracks and basic playlist management: you can now add and remove tracks to/from playlists. I was also finally (Sorry guys!) able to get my hands on a Mac and fix the tray along with some other annoying stuff. The app should also now be faster and more responsive, due to code optimizations and the switch to a proper DB (LinvoDB) for the library. For developers, this release makes it possible to create plugins without being necesarly streaming services. As a POC, I converted the Last.fm part to a plugin. Third-parties plugin installation will be coming with next release, as I still need to clean existing plugins code and find a way to opensource them. This release is an important milestone for Harmony, as it's the first release with the license model and without Coverflow. I also focused on making the plugin system simpler, so it will be easier for others to create plugins. Why remove Coverflow? Altough it was a great way to quickly visualize your library, it made some features harder to implement and slowed down development. In future releases, I hope to introduce a better visualization system or an improved Coverflow view. The main concern is to keep the UI simple. Don't hesitate to shoot me an email if you have ideas! New view for viewing artists, albums and search results. MP4, AAC, FLAC and OGG support.